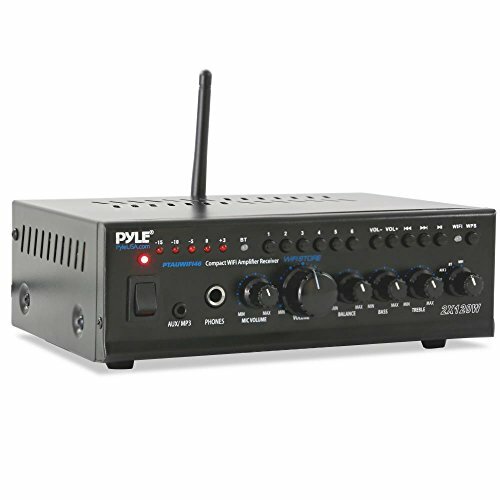 Pyle's Wireless Audio Streaming Stereo Amplifier PTAUWIFI46 is the perfect versatile solution for all of your audio needs, and is a easy way to get your music playing through a connected speaker system. Using the latest sound amplification technology and an impressive 240 Watt power output, this receiver is designed to allow you to stream your music wirelessly through both WIFI and Bluetooth connectivity to deliver pure stereo sounds. WI-FI CONNECTIVITY - With multi-room wireless Wi-Fi technology, music storage & playback ability, connect multiple devices & rooms to conveniently access your music library via the free downloadable 'MUZO Player' app available for iOS and Android. BLUETOOTH - Plug into any standard bookshelf or powered speakers and pair your Bluetooth device. It's that easy to turn your Bluetooth enabled Smartphone into a wireless sound system for your office, kitchen or any room inside or outside your home. SWITCHABLE PAGER & MIXING MODES - With 1/4" MIC input; set to PAGER for MIC to override music playback or set to mixing mode for same time playback or KARAOKE. Great for professional use in work environment or store. COMPACT - Perfect for home stereo use on tabletop or bookshelf. 2 Channel AUX1 and AUX2 inputs for Home Theater, DVD player, or Radio Tuner with adjustable Tone(Treble & Bass), Master(L&R), Balance & MIC Volume and LED lighting. MULTI-VOLTAGE POWER SUPPLY - Changeable 110V-240V input with fuse for protection against surges and short circuits makes this stereo amplifier ideal for worldwide usage. Enjoy this home stereo amplifier with unparalleled sound clarity.